Editor’s note: Naveen B Ramu submitted his following personal story to Global Young Voices. You too can submit yours to us here. Today’s world is home to more young people than ever before, with 1.8 billion people between the ages of 15 and 29. Around 87 percent of them lives in developing countries. Demographic trends and projections make it clear that the proportion of young people in the global population is declining and it is predicted to fall below 20 percent by 2075. The next few decades, therefore, are an unprecedented window of opportunity for the world, and developing countries in particular, to reap the promise of this ‘demographic dividend’ (GYDR, 2016). • An essential resource for sustainable development and poverty eradication. 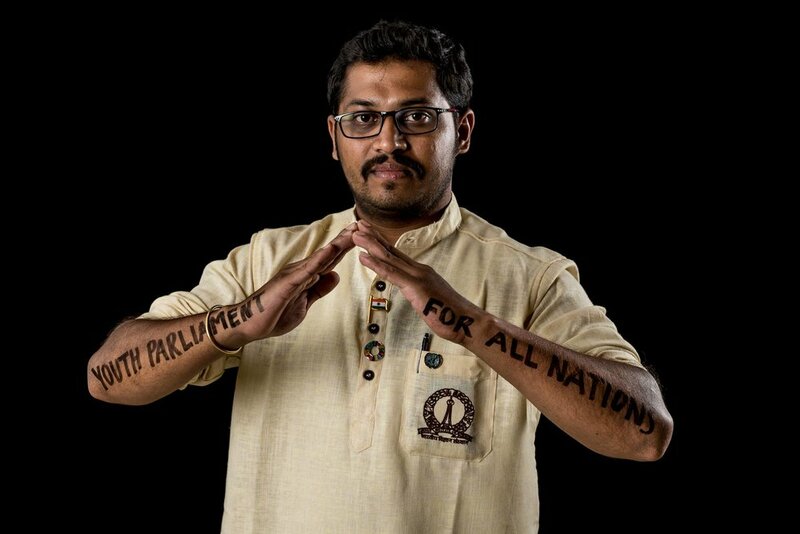 The world’s parliaments are not a place for young people. According to the Inter-Parliamentary Union, of the 45,000 members of national legislatures all over the world, only 1.9 percent are below the age of 30 and 14.2 percent are below the age of 40. Nearly one-third of ‘lower chambers’ of parliament and almost 80 percent of ‘upper chambers’ surveyed do not have a single member of parliament who is below the age of 30. Of the world’s young MPs who are below the age of 30, only two-fifths are female, according to Inter-Parliamentary Union 2016 (Global youth development index & report, 2016). According to the Registrar General of India, 34.8 percent of India’s population is between 15 and 34 years old and it’s expected to lower by the year 2021. Around 60 percent of India’s population is below 34 years old, which is an unrivaled youth demographic. Youth in the age group of 15 to 29 comprise 27.5 percent of the population. India is expected to become the 4th largest economy by 2025, right after the United States, China, and Japan. The population of India is expected to exceed 1.3 billion by 2020 with an average age of 28, which is considerably lower than the expected average ages of China and Japan. NYP-2014 provides a holistic vision for the youth of India, which is “to empower the youth of the country to achieve their full potential, and through them enable India to find its rightful place in the community of nations.” To achieve this vision, all stakeholders must work towards 5 key objectives. This requires specific action in 11 priority areas, which include: creating a productive workforce, education, entrepreneurship, employment and skill development, developing a strong and healthy generation, health and healthy lifestyle, sports, instilling social values and promoting community service, promotion of social values, community engagement, facilitating participation and civic engagement, participation in politics & governance, youth engagement, supporting youth at risk and creating equitable opportunities for all, social justice. In regards to the age profile of the members of the lower chamber of the Indian Parliament, youth members share is ashtoningly low. The greater share goes to members between 41 and 55 years old, followed by ones between 56 and 70 years old. This data shows that youth representation in the Indian parliament is not adequate. Governance requires an equal representation of citizens, and given that youth in the age group of 15 to 29 comprise 27.5 percent of the population, it is essential to stimulate youth participation in politics, democracy, accountability, and governance. This will help create a generation of future leaders of the country. Youth are the future of the nation and must be encouraged to participate in politics at local and national levels. According to the national youth policy (2014), youth organizations in India are “fragmented, and there is little coordination between the various stakeholders working on youth.” And though there are various national platforms and party youth wings, NYP (2014) highlights “there are no systematic channels for engagement between the government and young citizens and no mechanisms for youth to provide inputs to governments.” Judging from the analysis of global youth development report, 2016 and national youth policy 2014, it is pretty evident that there is a real need for youth participation in politics and decision making processes. NYP 2014 also stressed the need for a formal institution to address the real needs and aspirations of the Indian youth. A Youth Parliament could act as a young advisory body to the government to update about current happenings in social, economic, environmental, scientific and technological domains. Youth can be leveraged as a resource to monitor the implementation and promote accountability of welfare schemes and development projects across the country. In India, there are 47 central universities, 74 institutes of national importance, 290 public universities, 260 private universities, 123 deemed-to-be universities, 5 institutes under state legislature act, 13 state open universities and 1 central/national Open University. Every single one of them should have student representative bodies, either elected or nominated. Then, the heads of these student representative bodies could become members of a Youth Parliament, that would ensure youth representation across the country. Given these facts, it is pretty evident that it is time to have a formal youth representative body inside the Indian Parliament. The rest of the world should also involve youth in decision making processes. This would empower youth, politically and socially, by making them drivers of change towards the realization of the agenda 2030.